Mississauga is a Canadian city attached to the province of Ontario in West Toronto. Serving as an official headquarters for many major corporations in Canada, this city which is the fastest growing locale offers a host of employment opportunities for skilled workforces. This way, software and IT personnel with expertise in Agile Management and Certified Scrum Developer Certification will gain an edge over others as they choose to sign up with KnowledgeHut. KnowledgeHut provides online training in the Certified Scrum Developer Certification in Mississauga. The CSD training in Mississaugaof KnowledgeHut thus comes as a boon to IT and software engineers along with testers and coders through an in-depth understandingof Scrum principles and Agile engineering concepts. What is the course all about? Scrum Development helps programmers and testers to simplify the process of developing complicated programmes. ApplyingScrum tools and Agile Management principles, a methodical approach in the dissemination of information brings in the convenience of implementing agile practises in the Scrum environment that is desirable to professionals and organizations alike. Upon the successful completion of the course, candidates will gain a professional edgeby improving their workplace interactions with teammates. Benefits of the Course: After the completion of the course, professionals can deliver projects in the scrum environment applying agile methodologies. 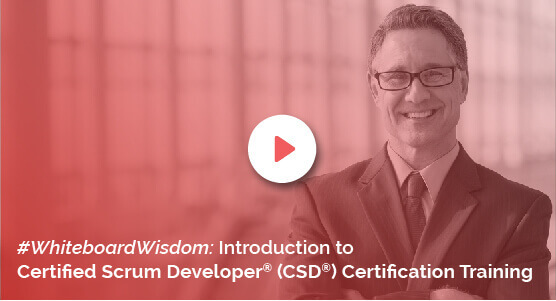 With the demand for CSD Certification in Mississaugagrowing by leaps and bounds, it is majorly due to the fact that this training and certification simplifies complicated product development. Ultimately, professionals can flash the specially designed logo of the Scrum alliance on their resumes as part of attracting attention from prospective companies and recruiters. The KnowledgeHut Way: The online Certified Scrum Developer training in Mississauga at KnowlegeHut is provided by an eminent trainer who makes the e-learning course an interesting learning process with a nominal cost. This way, engineering and IT professionals at Mississauga can enrol for this course and make the most of the aids like exhaustive course materials which provide in-depth information of basics. Accompanied by a demo andlectures along with an interesting workshop, a host of practice sessionsbring in the practical training by an expert tutor at KnowlegeHut.